Bebe came home one day surprising me with a box of Gevalia Cappuccino Toblerone. Yes. Toblerone. "Interesting", I said. That same day, I fixed myself a cup of hot cappuccino Toblerone and just enjoyed it all the way. 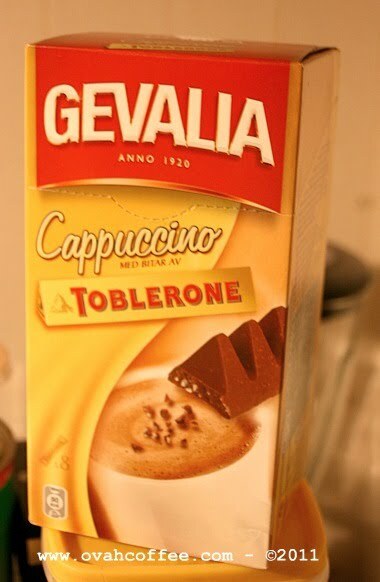 A box of Gevalia Cappuccino Toblerone contains 8 sachets, 21 grams each and costs about 30 Swedish crowns [around 4 to 4.50 US dollars/box]. Sounds expensive at first but for 3,75 Swedish crowns per cup, this is a lot cheaper compared to buying one from the leading coffee shops in this country. So, how does it taste? --- so creamy cappuccino with the lovely taste of chocolate-nougat-honey combo. Need I say more? Oh. Others say that this prep is too sweet but for me, it's just how I want it to be. How to prepare it? All you need is a teaspoonsful of common sense and you're on your way to having one cup of the best tasting cappuccino to kick start your day. Have a fantastic coffee-filled Saturday everyone! have a great week ahead :) congrats! Hello hello! Haven't noticed the comment earlier. Have had issues with missing blogger comments. I am glad that it's fixed two days ago. Will definitely grab the award. Thanks thanks!